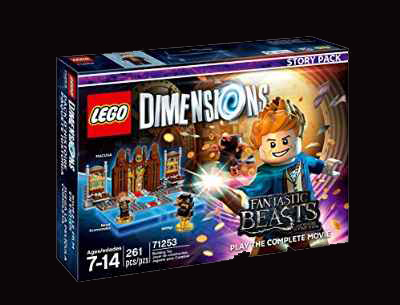 Fantastic Beasts and Where to Find Them Story Pack Provides a Complete Movie-Based Gameplay Experience with Six Action-Packed Levels and an Original LEGO Gateway Build. Announced this week the release of six highly anticipated expansion packs for LEGO Dimensions, the LEGO toy and videogame hybrid, led by the Sonic The Hedgehog Level Pack and the Fantastic Beasts and Where to Find Them Story Pack, just in time for the November 18 release of Warner Bros. Pictures’ all-new adventure in J.K. Rowling’s Wizarding World. The Fantastic Beasts and Where to Find Them digital in-game content will be available on November 18 at 11 am EST in the US and Canada, at 10 am PST in Mexico and in other international territories at midnight GMT. Players wanting to bring Gremlins to life in LEGO Dimensions can add the Gremlins Team Pack which includes popular rivals Gizmo and Stripe LEGO minifigures. Each will unlock the Gremlins Adventure World, where players can explore the Cinema, Clamp Industries, the High School, and so much more. Gizmo’s Combat Roll and Dash Attack abilities can be used to get him out of sticky situations and Stripe uses his claws with his Vine Cut ability. Players can rebuild the 3-in-1 R.C. Racer vehicle into the Gadget-o-matic and Scarlet Scorpion and the 3-in-1 Flash ‘n’ Finish into a Rampage Record Player and Stripe's Throne. Fans of “Land of Ooo” can add a Fun Pack based on Cartoon Network's Adventure Time with a Marceline the Vampire Queen LEGO minifigure. Players can activate her Sonar Smash and Bolt Deflector abilities using the Marceline Axe Guitar to solve puzzles and battle enemies. They can also build and use Marceline’s Lunatic Amp to make some noise, and then rebuild it into the Shadow Scorpion and Heavy Metal Monster for extra in-game powers. The pack will release in North America first at Toys “R” Us.